Good food is always important for a successful vacation. I’ve been to vacation spots where the amenities were good but the food was lackluster—buffets with tough meat in a non-descript stew and very red spaketchup1, it can ruin a vacation. 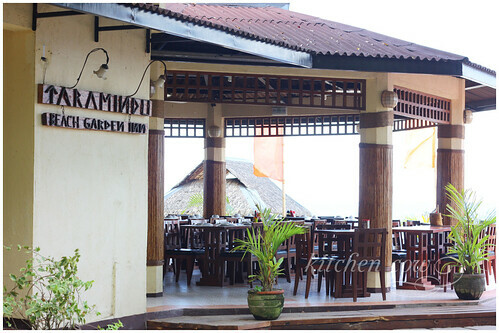 This summer, we were lucky to stumble upon Taramindu Beach and Garden Inn. A small beach house in Laiya, San Juan, Batangas, Taramindu shares a common beachfront with the other resorts in the area. 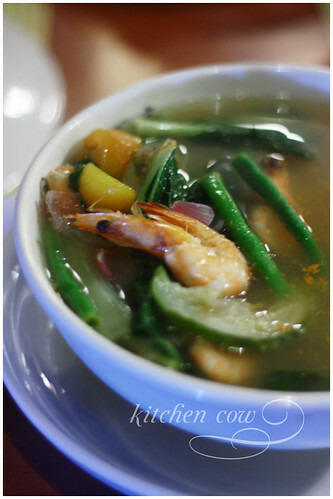 Taramindu offers an ala carte menu, unlike most of the Laiya resorts that go with an eat-all-you-can buffet. This can be taken either as a pro or as a con. There have been instances when I couldn’t find anything appetizing from buffet meals. So unless it’s a restaurant famous for its buffet offerings, ala carte sounds like a better idea. We arrived shortly before noon so we ordered for lunch while waiting to check into our rooms. Going classic Pinoy family meal style, we ordered a bunch of main dishes to go with rice. 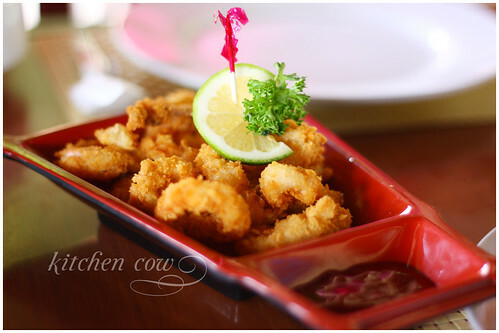 We tried the Calamares—perfectly done with a crisp batter and cooked-just-enough-to-remain-tender squid. Sinigang is always welcome, so we had the Sinigang na Ulo and Sinigang na Buntot ng Isda. The broth was sufficiently sour while the fish was delightfully light yet meaty fish. I was told that the fish they used is called Dorado. It’s something I’m not familiar with so it served as a pleasant surprise. 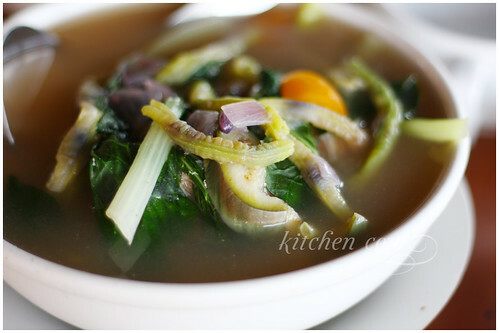 For our vegetable dish, we had Pinakbet. 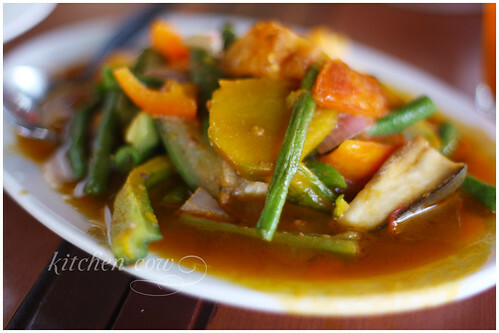 Their pinakbet is cooked Tagalog-style, with plenty of veggies and made more flavorful by bagoong alamang. Meat! Must have meat! 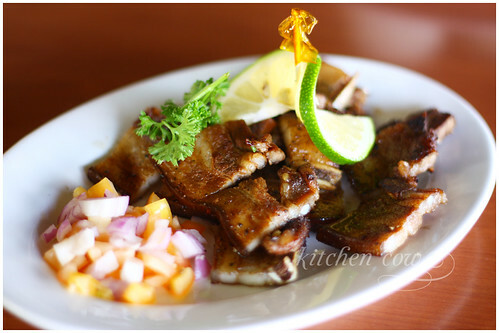 Our meat of choice was pork liempo, sliced thinly and grilled, then served with a side of tomatoes and onions. Yum! Served with loads of rice, we had a very satisfying and filling lunch. In the afternoon, we all decided to lounge along the shoreline. We were pleased to find out that Taramindu serves snacks on the beachfront. 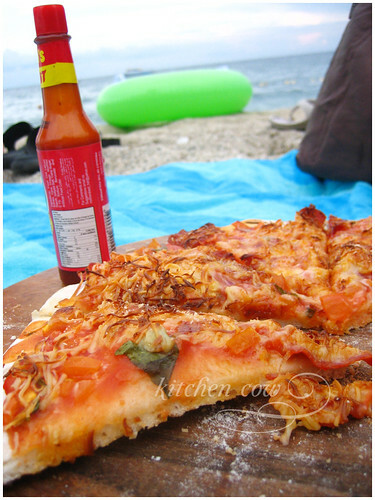 It was definitely a novel experience, enjoying a freshly baked, homemade pizza on the beach. Imagine, biting into a slice of crisp pizza, loaded with fresh tomatoes, basil and pepperoni. NOM! and Inihaw the Tilapia. The food, generally, was still good but it wasn’t as fantastic as our lunchtime spread. The restaurant was packed with guests, not only from Taramindu but also from neighboring beach houses, so I guess they had difficulty attending to everyone. 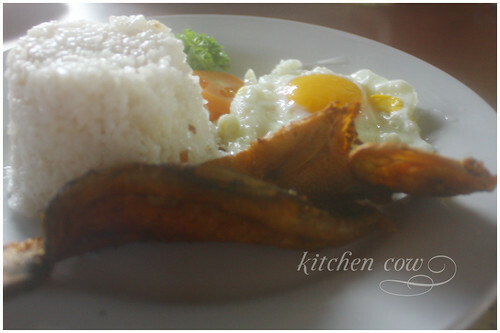 Breakfast was a –silog affair. Choose your favorite protein to go with the sinangag and itlog. I picked Daing na bangus. Served with coffee, a heavy breakfast like this, enjoyed by the beach, is a very nice way to start your day. Overall, the food was great. Flavorful, hearty, and very much like home cooking. It’s exactly what you’d love to eat at home, only this time, it’s seasoned by the sun, sea and sky. Sometimes, when we go on short holidays, we forget how important food is. We forget how it can make or break a good vacation. I’m glad that Taramindu delivers well in the food department. It was definitely a great ingredient for creating an enjoyable weekend vacation. 1Spaketchup – Cheap spaghetti sauced with a mostly banana ketchup sauce. Not to be confused with Filipino Spaghetti. This entry was posted in food trips, restos & eateries and tagged Accomodations, Batangas, Beach, Garden, Inn, Laiya, philippines, San Juan, Taramindu, Vacation. Bookmark the permalink. The food was good though, and that for me is a good enough reason to pick them. This other resort we stayed at last year naman, Laiya area rin, so disappointed me with their food, kaya parang ayoko na mag palipat lipat ng puntahang resort dun. 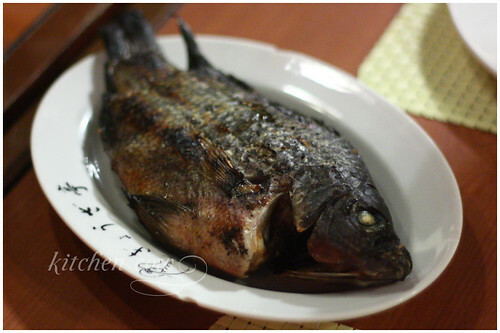 Btw, how did you deal with meals at Tivona? 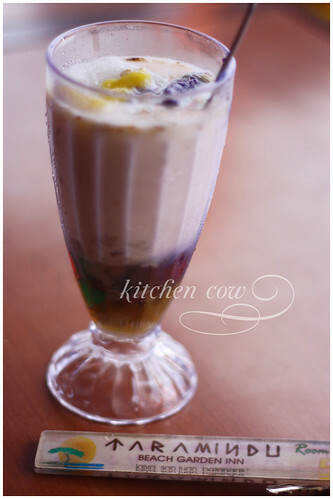 Did you eat at Balai or Blue Coral instead? Or did you cook your own? We were supposed to go there, kaso we were worried about the food situation kaya when we heard that Taramindu still had available rooms, we chose them instead. Their website says “.. a long coastline of white sand”. Is it true? 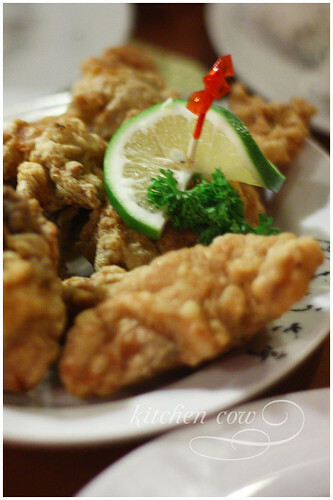 Pingback: Taramindu Beach Garden Inn: Good Food, Good Vacation | bento … - All type of RECIPES!.. Yes, a good vacation site needs good food, too. We mostly forget this in the excitement to visit a new place. I’m glad that you found one like Taramindu! Must visit! Hi there! The website says that you need to avail of the food package. So does this mean that the food you featured are those in their food package? We plan to visit the Laiya area in July and mooking for a good place. Yes. Most of the resorts in the Laiya area require visitors to purchase food packages from them, mostly in the form of buffet meals. Unlike them though, Taramindu imposes a consumable per head rate for use on their ala carte restaurant. If you’re with a group, you can pool your consumables together so you can budget it. If you go over, you’ll just have to pay the extra when you check out. I find this a good arrangement because one, their per head rate is lower than the other nearby resorts, and two, you can choose what you want to eat. Their prices are reasonable — it’s just like eating at Gerry’s or Giligans and the portions are meant for sharing. You may want to make your food arrangements in advance though, say a hour or two before so you don’t have to waste your time waiting. If you’d like to bring your own food though, you may want to check out Tivona, the resort right beside Taramindu. I haven’t stayed there but I did my research (:P), they have non-airconditioned rooms that come with a cooking area. They don’t have a restaurant though so if you’re staying in the airconditioned rooms that don’t have cooking areas, you’ll have to hop over to neighboring resorts to get your grub. Thanks for the reply and recommendation. Will google for Tivona. Thanks a lot! Thanks for this Kaoko! I’ll recommend Taramindu for our Team Building Seminar Do they have an email address? Really? That’s awful! My mom did most of the arrangements for us so I had no idea what they were like e but I didn’t hear any complaints from her. Sayang, if they’re losing business that way. The resort’s managers (the parents of the owners I think) are a pleasant older couple who are pretty hands on when it comes to looking after their guests at the resort. But if it’s a Team Building Seminar, I assume you’re a bigger group, baka better idea would be to go to one of those resorts where there’s a buffet, so you have less things to worry about—you just show up during mealtimes! Went there with officemates last year. Loved their grilled squid! Couldn’t get over the tamarind drink, too. Gyeah! I wasn’t able to try their Grilled Squid. And to think it’s one of my favorite dishes. And yeah, their Tamarind drink is great, especially when loaded with lots of ice. Hi, I’m making a deposit to Tamarindu to close out our date of reservation but Tonette gave me a PNB account that’s named after Jose Mendoza Jr. Is it Legit? Sorry but I can’t help you there. This is a personal blog. I am in no way affiliated or connected to Taramindu, other than as a paying customer, just like you. Hope you get to contact them soon.